Having read and loved Megan Erickson's Bowler University series, I knew that Megan would be an author I could depend on to make me smile with her sweet, fun romances. This is my first experience with a m/m romance and having known Megan's writing style, I am really glad hers is the first I read. Justin and Landry's story will put a smile on your face and will have you rooting for these two the entire time to overcome any obstacles that may stand in their way. These two certainly have their share of obstacles too. I think that is my favorite part of this story to be honest. It makes the reward that much sweeter, because they have had to fight for it. Landry has always known who he was and has had to deal with the fact that he is in love with his best friend and that they can never be. Landry was such a sweetheart and every time Justin lashed out at him, I felt myself flinching because Lan was just such a good guy. A friend and I were talking about Landry's character and whether or not he had changed throughout the book and he does a little bit. He becomes more confident as the story unfolds and when he realizes the truth about Justin. In the beginning he's not as open and comfortable as he gets to be later on. Their relationship also starts out a bit strained as well- they are not as super close as they once were, which is mainly due to Justin. Oh Justin. I felt for him so much. He is struggling with his identity and who he is. He has known for a long time that he is gay, but has never felt comfortable coming out into the open about it. His mother is a politician for one and two she expects Justin to come on the campaign tour with her once the summer is over. He has always done as she's asked, never really standing up to her and admitting the truth about who he is. Justin is fighting an internal war within and he does lash out in anger several times, hurting Landry in the process. As someone who does the same thing when angry, I can relate to Justin and that is what makes me so sad because no one else deserves our wrath just because they happen to be in the line of fire. I like that Justin is so real. This is a huge deal for him and it takes a lot of courage to completely own up to the fact that he is different, especially with the way the world looks at homosexuality. I absolutely love the setting of this book too. I am a huge road trip fan myself, and while this wasn't the happiest of trips to take- Justin and Landry are revisiting 12 spots Justin's father marked in his atlas before he died and is stopping at each one to spread some of his ashes- it was one they won't ever forget. I also enjoyed that we would get to see some of Landry's blog post entries at the end of some chapters to detail the trip. I loved getting a little bit of the book in his voice! Overall, this was definitely a cute, sweet read about finding yourself and accepting yourself. Love is love and I'm glad Justin could get past all of his hangups and fears to just let himself be his true self. My only minor issue was that at times I thought their romance felt a bit cheesy and overdone. Granted, that could just be the cynic in me too and I'm a bit jaded when it comes to love. I also haven't been around many men in my life who are that expressive about their feelings, so maybe that's why I felt this way. No matter though- both of these guys have such great hearts and I loved the way their story concluded. I am so glad I read this one and as always can't wait for what Megan does next. This sounds really good and really sweet and I love the road trip aspect of it! 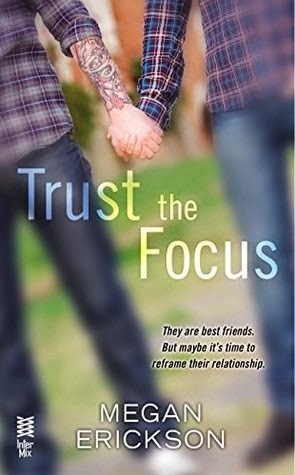 I haven't read an m/m romance before but that is something I am looking to change! Great review! Thanks Teresa! I think you'll enjoy this one alot! It was definitely cute. Oh Justin :( I WILL GIVE YOU ALL THE HUGS, JUST BE YOUR AWESOME SELF!!! Hahaha. I loved Justin to pieces. He broke my heart and I just wanted him to be himself and be comfortable in his own skin! I agree with you on the road trips- I loved Amy and Roger! The hope that springs from the not so 'happy' ones is always awesome. This sounds so sweet, Jessica! I've had my eyes on it for a while now and I wanted to get it off NG, but I controlled myself. I'm just going to buy it because it sounds wonderful. Their romance sounds adorable even though they had a ton of obstacles to overcome. It's good to know that the obstacles made their romance even more satisfying at the end. Thanks Nick! I think you'll enjoy this one. It was definitely cute and sweet, but I liked the realism of it! LOL. I am glad we still enjoyed this one though. The road trip was beyond awesome! Great review, Jess! I'm happy you liked this one too. It's just a sweet love story, and you're so right - it feels very very rewarding. I loved the road trip setting and the fact that we get some of Landry's "thoughts" too. I think Megan is posting something from Landry's perspective on a blog soon? Will have to look for it! Thanks lovely! Oh is she? Yes! I definitely want to see it! I liked seeing Landry's contributions! It's like this book can do no wrong! I literally just saw another glowing review of this one. I have not read any of Erickson's books, but I definitely want to read her Brazen books. So glad you enjoyed this one, Jess! I'm going to have to go get this because I've heard nothing but amazing things about this one! plus I loved her bowler university series so. Okay, actually I just opened up a tab and bought it. Haha! :) Can't wait to read it! I've actually never read an m/m romance either so this will be new! Haha! Yay! I'm glad to hear this! It's definitely a sweet story and because I loved Bowler so much, I knew it would be in the same vein as those!